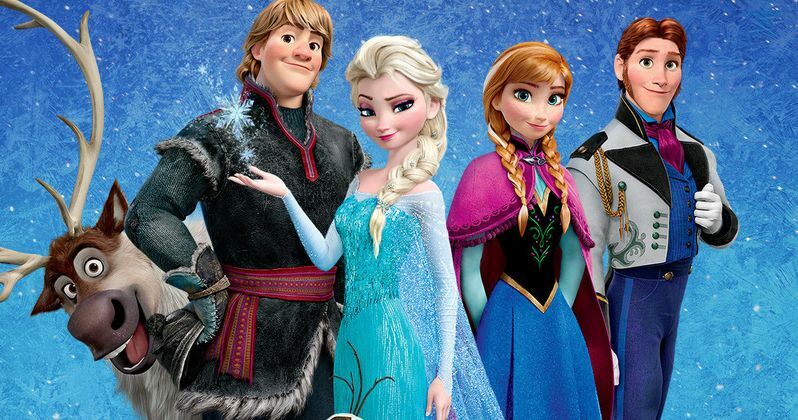 Disney's Frozen was one of the most talked about movies of 2013, taking in just over $400 million domestically and over $1.2 billion worldwide during its theatrical run, making it the highest-grossing animated movie of all-time, and fifth best among all movies. The studio did announce in September that they are making a short film entitled Frozen Fever, set to debut next spring. There are also Frozen characters appearing on ABC's Once Upon a Time, with a stage musical currently in development and a Frozen attraction debuting at Disney World in 2016. So what about a sequel?
" That they're all in the works, ha ha!" When asked if she had signed on to reprise her role as Elsa once again, Idina Menzel said she won't be a part of the stage musical, but hinted that she will "hopefully" be back for the movie sequel. "Ah, yeah sure... Not the stage show - I don't know what will happen with that - but the movie hopefully. We'll see. I'm just going along for the ride." It isn't known if a screenplay is being developed at this time, or if Frozen directors Chris Buck and Jennifer Lee will be back at the helm. It's worth noting that Disney does have an unspecified movie set for release in November 2018, but it isn't known if this is being held for a Frozen sequel. We should also point out that when Idina Menzel says 'movie', its entirely possible that she is talking about the upcoming short. Would you like to see a theatrical follow-up to Frozen? Chime in with your thoughts below.